ALUS Canada, A Weston Family Initiative, is a national program helping farmers and ranchers to produce cleaner air, cleaner water, more biodiversity and other ecosystem services in their communities. As a recent Alberta Emerald Award-winner—and guided by a Clean50 /Clean16 award-winning team—ALUS Canada is a recognized leader in sustainability that is revolutionizing the way Canadians support the environment. ALUS Canada has so far disbursed nearly $6.5 M in funding to ALUS communities across Canada, an investment that is multiplied by farmers, ranchers and communities on the ground. As a result, there are currently more than 18,500 acres enrolled, 575 participants and 21 ALUS communities in five provinces, and the program is rapidly expanding. With your support, ALUS will grow the program nationally to create a healthy landscape that sustains agriculture, wildlife and natural spaces for all Canadians, one acre at a time! Every dollar you contribute is multiplied by the investment of participating farmers, ranchers and communities on the ground. "We believe strongly in the ALUS model, which delivers tens of thousands of acres of natural habitats by engaging Canadian farm communities. " "It’s all very well to promote conservation, but we can’t regulate farmers into providing ecosystem services; we have to work with them, and provide the resources to encourage them to produce these valuable services. That’s why ALUS is a great way to go. " 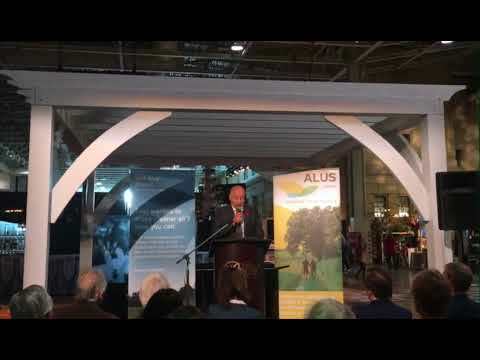 "ALUS Canada is doing really important work. We know that we need to be working with farmers when it comes to water quality, so it’s a very important partnership." " Our farmers have shown why Prince Edward Island is mighty by working together with the ALUS program and government on an initiative that will benefit the natural environment of our entire province. " "Ontario Nature is dedicated to helping ALUS Canada grow the program in Ontario. ALUS is an incredible model to support the leadership role farmers play stewarding their land for the greater good." "Through the ALUS program, Prince Edward Island farmers have demonstrated their commitment to help protect and enhance the environment. We are pleased to partner with ALUS Canada [and] build on the successes of the ALUS program in this province. "